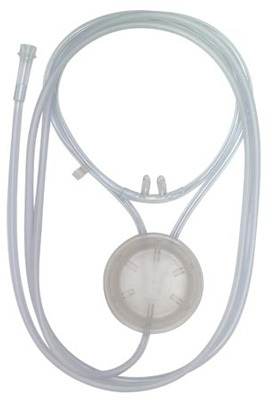 The Standard Pendant version of Oxysaver oxygen-conserving cannula is a single-user product for the nasal distribution of oxygen. Comfortable - talk, eat, or drink. For use with AEROX flow control and other systems able to deliver low oxygen flow. Extend oxygen duration by up to EIGHT TIMES compared to non-altitude compensated systems with masks or standard cannulas. The only conserving cannula APPROVED FOR AVIATION USE by the manufacturer and tested to 18,000 feet. Review: Pendant works as advertised. I really like it for when out and about to save me oxygen. It provides me the additional burst of oxygen when I require it when first connecting. What I don?t like is how difficult it is to wear. The tubing is over sized and keeps falling off you ears. Another problem is it refuses to stay right side out. Have tried to soften tubing, not much success yet but will keep on trying. With all its faults I still feel it is worth it. The hose is to stiff,but the product works. Review: The tube from the collector is too large and won't stay behind my ears. The manufacturer refuses too deal with it. So it is un acceptable. Review: I have emphysema, and recently flow rate increased from 3 liters per minute to 4. Have a continuous flow portable oxygen concentrator which only goes to 3. I've been using cannula and have worked well, even when working out. Review: Easier to wear than other cannulas I have used in the past. Good product, would buy again. Cons: Tubing refuses to stay on ears. Was this review helpful to you? Yes No 17 Other people found this review helpful. Was this review helpful to you? Yes No 12 Other people found this review helpful. Q: what is the expected usage time to replacement for this ox conserving cannula? What is the shelf life? A: Aerox suggests that cannulas are replaced every 200 hours. Q: Can this cannula and pendant be used with other pocs? A: Oxysaver Oxygen Conserving Cannula (Adult) with Pendant works with systems able to deliver a low oxygen flow.